Yesterday I had the occasion of attending the talk “How Much Reforms are there in the 2010 Campaigns?” organized by the Ateneo School of Government. Discussants present were Joel Rocamora of the Institute of Popular Democracy and Ramon Casiple of the Institute for Political and Electoral Reform. Allow me to echo the gist of the discussion. Is Noynoy the Reform Candidate? Rocamora was clearly partisan and really only spoke of the Aquino platform. He speaks of a Reform Constituency that has been brewing in the past two or three years. This ragtag group was energized by the massive turnout of people at Cory’s funeral and the consequent decision of Noynoy to run for the presidency. The anti rent-seeking reforms are meant to curb corruption, allow the leveling of the playing field in business by reforming the regulatory system running the economy and strengthen the capacity of government to provide infrastructure by removing patronage in the allocation processes. Now why is the majority of the reform measures unveiled so far in the economic sphere? Rocamora proffers an answer – a big chunk of Noynoy’s supporters are in the business sector. Those present at the pow-wow last week were not only MBC members but also managers (Management Association of the Philippines) and finance people (FINEX). Rocamora recounts a chiding he got from former NatDem comrades - Is this, finally, the “reform bourgeoisie” a-coming? “Hey, you’ve been looking for a national bourgeoisie for forty years,” he replied. Indeed, half a century late, in my opinion. But better late than never. Rocamora describes a campaign team with different clusters of reformers. The clusters are charged with different issue areas and are tasked to translate policy papers into speeches. We can expect such speeches to be delivered in the coming months. In conclusion, Rocamora expresses his concern not for the prospects of reform but what an Aquino administration might face once it is in power. He is not confident that reformers will get the majority of the Congress (both the lower House and Senate). This will make it difficult to pass reform measures initiated by the Executive. The second discussant, Mon Casiple, concludes that the presidential race is really only between two contenders at this point. With regard to platforms, Casiple is circumspect. He says “these are statements of intentions designed to attract the greatest number of votes.” A platform is not a program of government – which will not be unveiled until after a candidate wins. On the other hand, he acknowledges, a platform cannot be all that different from the nitty-gritty of governance. What Casiple advises us to do in the coming months is to listen to these platforms carefully and to “read between the lines.” While ALL platforms look to be “reformist”, there are nuances. He cites the difference between Aquino and Villar is that the former explicitly calls the Arroyo administration “corrupt” while Villar blames the “corrupt system.” Aquino has also categorically said he will not raise taxes while Villar leaves the possibility of raising them. Casiple advises voters to deal with the record of these candidates and the “circumstances of their way to the presidency.” Here I suppose he means for us to judge whether these politicians have played fairly to win the prize. Casiple proposes that the 2007 elections opened the field for non-conventional campaigns of non-conventional politicians. Fr. Ed Panlilio and Grace Padaca came completely from left field but won governorships against conventional wisdom. Casiple acknowledges that the Noynoy campaign is also a non-conventional one. It has so far swept aside Mar Roxas, Noli de Castro and Chiz Escudero. He hints at Joseph Estrada throwing in the towel as well. Casiple concludes by saying the reform agenda, at this point, is not a laundry list of policy initiatives. It is “more about symbols” and a negotiation of what we mean by “reform.” He says what we know at this time is that we are rejecting the status quo. I take this to mean we are rejecting nine years of Gloria Macapagal Arroyo. Still the greatest influence in the critical perspectives of my field, Prof. Duncan Foley reminds me why I found Marx fascinating. Is Marxism Relevant Today? from Committee on Global Thought on Vimeo. "The other thing that I'd like to say about Marx, at least from my own reading...is that he problematizes reality in the following sense. We have an awful tendency to sort of putter along, get up in the morning, get dressed and assumed that the way things are is somehow the way things have to be. Actually, mainstream economics goes further than that and has a big strength that says the way things are is the best way things can possibly be. Marx when he was a young man wrote a piece called 'For the Ruthless Criticism of Everything Existing' and he lived that out and wrote that out to a very considerable degree. And the more you read Marx, the more, I hope, you will be drawn to find the world we live in extremely puzzling, extremely problematic, extremely strange as to why it is just the way it is. And why the things happen that do happen." Surely, in the short history of modernity and global capitalism, this is not as good as it gets. This clip, from the German film "The Downfall" is probably the most parodied clip on Youtube. See Hitler react to the news of the RH bill not making it in Congress. In today’s address to the Makati Business Club, presidential hopeful Noynoy Aquino unveils his “economic vision and platform.” Let me unpack some of his key points. Aquino underlines the importance of the sanctity of the ballot in order to gain a true mandate from the people. He also makes a direct relationship between mandate and accountability. "We must now become a government committed to accountability. A government that works with the people in achieving long-term change." Where mandate might be the currency that flows from the governed, accountability is that which flows from those who govern. Above all else, this two-way relationship is the bedrock of any democratic polity. So far, so good. "Why can’t we progress? What is it in us that limits or prohibits our growth as a people and as a country?" "We have a growing underclass that statistics tell us have given up looking for work. A permanent underclass that includes the five million of our countrymen that are illiterate, which means their opportunities in life will always be limited to living hand-to-mouth." Aquino’s vision of society is one which corresponds with many ‘developed’ countries in the world, that is, those that have transitioned from an agrarian-based economy to that of a full capitalist society. "In every developed, progressive, prosperous democracy, it is the middle class that is the biggest class." So how does one transform the Philippines from a country with a permanent underclass to one with a large middle class? He hints to some answers by mentioning the following: creating a level playing field for enterprise, putting to rights public finances and rationalizing the agricultural sector. "We will encourage free and fair competition in a level playing field. One not need be a crony in order to succeed in the field of business. More importantly, government will not compete with business. Nor will government use its regulatory powers to extort, intimidate and harass." In short, Aquino promises a government that does not seek rents. Others have accused the Arroyo administration as "predatory." "There is a widespread perception that success in the business milieu can almost be directly correlated to your closeness to the powers-that-be. Because of this, some players in the industry are forced to focus their activities on maintaining relationships in order to retain the favors that they receive in exchange for cultivating that relationship. This has fostered the wrong kind of competitiveness. While it may work, locally, for now, it has not enabled these players to become competitive in the world market, where the rules of the game do not take special relationships into consideration." This acknowledges that local business interests have prospered not because they are able to provide competitive (i.e. the “best”) goods and services but because they have the political connections and know how to pull the right strings. The incestuous relationship of government and certain business interests forms the core of patron-client relationships which shape the country's economic system. This rent-seeking government is the opposite of Aquino’s envisioned model – government should play the blind contract enforcer and provider of public goods. Businesses which prosper, in Aquino’s ideal, are those that do because they are competitive. And here Aquino makes another crucial point that should be of importance to any country that wishes to make the transition from an agrarian economy to that of a mature capitalist economy – the ability to create local enterprises that will be able to compete in world markets. The road to capitalist success, as demonstrated by the experience of many other countries in the last few centuries, is the ability to create a viable domestic market and to export goods (not people) to other countries. I do not know if I am reading too much from this, but I suppose it shows a realistic view as to what the transition from tradition to modernity entails – some people will have to make sacrifices but changes have to be made. The small-scale operation versus big firm analogy acknowledges we will be starting pretty much from scratch. As far as public resources go, there will not be a lot to go around in the beginning (hence the conscious choice not to underline the conflictual capital-labour problematic of any capitalist economy). Here I had hoped to hear more about social services and social spending, but I suppose this was not the audience to tackle such. In Aquino’s model, does government provide targetted social spending to catch those who might fall through cracks? Further, is he operating on the assumption that Markets allocate best? If so, this is a dangerous assumption to make. From what I gather, Noynoy is something of a fiscal conservative. He promises no new taxes, so how does he propose to finance government? He points to more efficient tax and duties collection and curbing tax evasion and smuggling. He then says he favours "universal low tax rates” rather than a progressive system (i.e. big income = big taxes, low income = low taxes). My knee-jerk reaction is that this goes against the fiscal principles of many developed countries. Even the most cut-throat (i.e. ‘competitive’) model of capitalist economies, the United States, usually taxes the rich more (although less so in the last thirty years). I do not know what to think about this. I will ruminate and get back to you. In response to the question of what he has done, he responds that many proposed laws do not a good legislator make. "Our problem is the lack of political will to faithfully implement the many world-class laws that our legislature has passed." His priorities as a legislator were in strengthening the capacity of Congress to reign in the Executive. My read on this part is that he was interested most in the watchdog function of the legislative. "It is in addressing this problem that I focused on the fiscalizing aspect of a legislator’s job – on Congress’ oversight and investigative functions." He then mentions some Executive-driven projects – NBN-ZTE and SCTEX. If Congress had only performed its watchdog functions better, such large-scale corruption scandals would not have occurred in the first place. I will agree we already have many good laws and they all look good on paper. Those who say he has not done anything tend to hammer him on his legislative output. I think he should do a better job of explaining to people that a lawmaker's job isn't limited to drafting bills. "As I said when I accepted the people’s draft, the job of chief executive is about the efficient allocation of resources. If you have hogged those resources for yourself, if you have lied, cheated, and stolen to gain power, how can you be trusted to lead the transformation our country needs?" Let me unpack some crucial points he made about the role of government. His are moderns views on the role of government and the role of chief executive. He sees himself as mere resource-allocator. "Resoure allocation" is, of course, a highly political process and I hope Aquino acknowledges such. As president he will come under tremendous pressure as various interests will constantly tug at his sleeves to curry favours. Given his record so far (not a whistle of misdeed or corruption), yes, I think we might count on Aquino not using his office for personal gain. His ability to control his government to do the same will perhaps be his greatest achievement. It is a worthwhile endeavour. I hope he has a gameplan on how he will do it because there are many, many entrenched interests who will do all they can not to upset the status quo. Business interests who are profiting handsomely under the current set-up, will probably not take kindly to "leveling the playing field." And "leveling the playing field", such a harmless-sounding term, will entail superhero-level political will. If Aquino delivers on this promise, it might arrest our descent into Fourth World status. "It is time that our infrastructure agencies and LGUs transform into cooperative ventures with the private sector by bringing forth an agreed public infrastructure program, based on a cohesive plan that optimizes the value of the entire network…Initially we want our infrastructure program to transform from being the means to enrich a few, to being labor-intensive and biased for employment as a means to pump-prime the economy." Here he shows an understanding that government spending (in providing infrastructure) has not necessarily brought efficient public works (roads, bridges, mass transport). The assumption is that partnerships with the private sector might curb inefficiency. Because government spends on building roads and bridges and manning mass transportation systems, then government employs people. The ideal in modern economies is that government ought to leave the private sector to provide employment. I think it safe to assume that in Aquino’s philosophy, the bureaucracy ought to be a lean, mean fighting machine. What about the couple of million civil servants rubber-stamping their way to retirement? Swim you wretches, swim! He only says that there is a need to review programs of the Department of Agriculture and to eliminate leaks and ensure the efficient use of resources. I am not happy with Aquino’s points on agriculture. Land reform is crucial on the road from Serfdom. Capitalist development hinges first on unlocking productivity of the land. Is it a conscious effort to downplay agriculture because of Hacienda Luisita? To me, this would be a huge mistake. Agriculture still employs majority of the labour force. It is a hugely important policy issue and deserves to be discussed in further detail. Perhaps the Makati Business Club pow-wow isn't the place to do it. When will he schedule a talk with farmers? Last, Aquino's vision of the Philippines is deceptively simple. He does not promise "first world status by 2020." Instead he promises to deliver a functional society, one in which institutions (both organisational and ideational) work as they should. "We must find a unity that transcends the divisions of today, based on a shared commitment to transforming our country into one that works: One where traffic flows well, garbage is collected efficiently, crimes are solved, justice is served, and our kids are educated properly. It works in the sense that you do not have to flee the country to move up in the world, improve your lot in life, and rise to the highest level your personal merits can achieve." Aquino has a specific vision of what he wants for the Philippines. His views on the role of government vis-a-vis the economy is very modern. I do not entirely agree with it, especially some statements hinting at what could be a naive view of the "contract-enforcing" state. There is little mention of welfare and the state's role in disbursing non-infrastructure public goods. In all, his vision's success rests on entirely on the will to shoot some entrenched interests in the face. Maybe even his family's. If he could do it, my hat's off to him. I suspect the Noynoy campaign is frittering away its massive lead by failing to deliver messages that will convince the faithful to hold on and convince the not yet converted to switch over. The natural constituency of Noynoy are the above thirtysomethings who have still have residual feelings for the country’s democratization process helmed by Ninoy and Cory. The younger voters will have no such nostalgia but will probably find Noynoy suitably hip and infinitely cleaner. 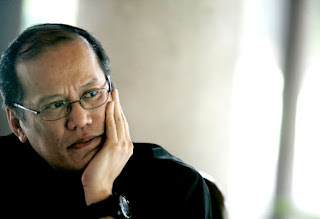 Among peers from the educated middle class however, I hear grumblings on three fronts – first, Noynoy should stop pressing the message of his being the son of his sainted parents. “We already know this, tell us something we don’t yet know.” Second, he should speak more strongly about his past achievements and what he has actually done both as a member of Congress and Senate. Self-effacement be damned. Its time to toot your own horn and market yourself better. Third, Noynoy has to hammer the message that his plans, embodied by his platform of course, will deliver a better future. If he can concentrate on delivering these three messages, then he’ll protect his lead. We already know you’re not corrupt, on to the next step ok? The more people get to know rivals Gibo and Gordon, the paler becomes Noynoy’s reflected glory. And more votes lost to the first two candidates gives Manny Villar a better chance to win. The presidential bid is Noynoy’s to lose given that we have reasonably clean elections. Time to switch gears. Sipag at Tiyaga, Galing at Talino, Nanay at Tatay…just doesn’t sound good. To achieve some sort of balance, the rabidness of American atheists on Youtube seems to be directly proportional to the rabidness American bible-thumpers. "The true genius of this message by Pat Robertson is that he is using the vast superstition, the vast paranoia that exists amongst the Haitian people to propagate the Christian message." Yesterday I attended a talk given by Prof. Randy David in the University of Asia and the Pacific. He addressed university students with his “Message of Modern Politics: A situationer on Philippine current politics.” Let me take this opportunity to echo salient points of his talk. I found the first part most instructive. His training as a sociologist requires him to always paint a broad historical picture, allowing listeners to situate themselves in the current situation as part of the national context. The second part outlines some historical details relevant to the present. The third part argues GMA has painted herself in a corner where her options have become restricted. And the last attempts to forecast what might happen this year. David observes that Filipinos are “sick and tired” of politics. In other societies, people are not overburdened with politics. And normally citizens only think about it during elections. The fact the politics consumes much of our national imaginary has both good and bad effects, he says. It is good in that citizens are kept informed. It is bad in that the constant politicking leaves little room to do much of anything else. It is time spent away from thinking about ways to improve education and health, growing businesses and the arts. He says in the region the Philippines has had the longest experience with elections and yet we cannot seem to get it right. Elections are a good way of making the transition from a ‘traditional’ to a ‘modern’ society. Here he gives quick yet unerring definitions of these broad concepts. A ‘traditional’ society is one of hierarchies. One might also call them ‘feudal’, ties and associations based on families. He also calls this society ‘limited-access’ in that only certain people enjoy monopolies of power and influence. A ‘modern’ society is ‘open-access’ and allows associations not based on familial or personal ties but through functions. They are ‘functionally differentiated’, allowing for clear divisions between politics and business, politics and religion, politics and other public realms. One might argue that a modern society is also more democratic. David then makes an astonishing claim, one that many of us will probably instantly recognize but which we have not yet articulated, most of all to ourselves. I know I was struck by it. David claims we cannot seem to make that transition from being a ‘traditional’ (i.e. hierarchical, monopolistic) society to a ‘modern’ (i.e. truly democratic) society. We are stuck somewhere in the middle, exhibiting characteristics of either model. And here is where David makes a crucial point. He asks, why is it important to modernize? He says it is important because “many young people are already leaving in disgust.” He means disgust with the status quo. Now more than ever, young Filipinos cannot see themselves in this particular context. He says it is now possible for Filipinos to pursue personal development and growth independent of their nation’s development and growth. This argument hit close to home. I have articulated before how I felt as though I were a cultural minority, believing in certain ideals and principles divorced from the reality here. To address political stability, David defines ‘governance’ as the ability to create “collectively-binding decisions”, that is, decisions that will apply to all irrespective of identity and position. He names public debt as a collectively-binding issue. All of us incur public debt whether we like it or not. He asks, how does government achieve legitimacy so its collectively-binding decisions are accepted? This can only be achieved through a democratic exercise free of coercion. He asks, and this one made me cringe I hadn’t realized it, “Can you imagine if we settle political constestation like the Ampatuans?” CRINGE. Political contest then will devolve to who has more guns, goons and gold to finance them. All matter of rhetoric, appeals to the public good etc. etc. will take a backseat. In such a scenario, how do people with no guns, goons nor gold make the people who do accountable? Here David makes another important point. He says the governments legitimacy and authority should not emanate from its coercive power, that is, the ability to force people to submit. Legitimacy and authority should be consensual. The LESS there is a need to force people to abide by collectively-binding decisions, the MORE legitimacy and authority it has. The two elements – legitimacy/authority and coercion are inversely proportionate. In simple language, a government that enjoys the approval and support of the governed does not need to use FORCE. Here David uses a statistic to drive home a point. The Philippines has the largest private security force in the world – these are the blue guards we see in every building in the country. HALF A MILLION. Almost thrice the size of the AFP’s standing army. We have gotten so used to seeing security guards toting guns, we have become immune. It is not like so in other societies, says David. And yes, I am reminded of my stay in Australia, where it took me 3 months to finally spot a police car. David also deplores the presence of security in the UP campus nowadays. He recounts how it was when he was a young professor, there were no security guards. We ask ourselves then, if visibility of police and quasi-police forces is an indication, then it must mean our current government does not enjoy legitimacy and authority? David begins his broad strokes with the declaration of Martial Law in 1972. At that time, many of our neighbours in this region were run by authoritarian governments. David argues that Marcos styled himself as a ruler in the middle of the dueling left (communists) and right (oligarchs), with the strong state creating a space for sped-up modernization. This was why, he says, so many UP professors at the time joined the Marcos regime, forming the backbone of the technocracy. They had high hopes for the Marcosian experiment. The experiment ran aground though. My favorite example here is South Korea. That country’s martial law regime, which took over in 1973 and ran almost as long as ours, delivered an economic takeoff that now counts South Korea among the richest countries in the world (i.e. a member of the OECD). The Marcosian experiment, far from strengthening the state-in-the-middle created new oligarchs and new insurgents. Instead of widening public space and access to public institutions, Marcos created pockets of privatized gain. David also tackles the difficulty of universal suffrage being made a tool for modernization and change. In other societies, economic rights were fulfilled first before political rights. That is, poverty and hunger were solved first before democratization. A citizen cannot take his or her political duties seriously if he or she is economically dependent. And so, until today, we have Filipinos who will gladly sell their votes for money. Cory Aquino’s transitional regime was saddled with problems. It had the difficult task of solving problems accumulated in 14 years under Marcos. Old trapos came in to fill public offices, those displaced by Marcos again back in the limelight. David argues that Fidel Ramos’ economic growth in the nineties didn’t trickle down to the poor. The 1997 Asian financial crisis made life even more difficult for the most vulnerable. And so by the 1998 elections, these marginalized sectors were in electoral revolt. And what better ally than Erap Para Sa Mahirap? David makes a difficult admission – EDSA Dos was a mistake. It was a mistake because Arroyo shouldn’t have been sworn in as president and that Joseph Estrada didn’t resign. He says there should have been snap elections. Here David says if one should review the Garci tapes back in 2004, one would hear the word ‘Maguindanao’ mentioned every so often. And lest we delude ourselves into thinking warlords only exist in Mindanao, let us think of all sorts of organized criminal elements such as jueteng lords operating in Luzon and Visayas. At the end of her almost decade-long reign, David claims that Gloria Arroyo has broken so many rules it would be impossible for her to give up power. She does not have an exit option like Marcos (who was flown to Hawaii by the US government) and she doesn’t want to do an Erap incarceration. Lastly the professor outlines five scenarios and we will see why charter change is crucial in all of them. 1. Failure of elections – automation breaks down, chaos and confusion ensues (whether spontaneous or instigated), AFP and PNP step in and we have a transitional government. 2. Elections held but no proclamation – local officials, including members of Congress are sworn in, but no national winners. Winning local candidates vote for charter change and elect House member Gloria Arroyo as prime minister. 3. Wholesale automated cheating – pro-Gloria incumbents are re-elected, changing government, GMA as prime minister. 4. 2010 results are credible, having a legitimate new government. GMA in Congress takes speakership of the lower house, pushes for con-con, shift to parliamentary government, GMA as prime minister. 5. 2010 elections are credible. GMA doesn’t get speakership, is possibly indicted or at least removed from office. In conclusion, David reminds us of three important points. First, that political stability is important and that elections are important. Second, GMA has been there so long she has privatized and distorted democratic institutions. Lastly, and perhaps the most important note, how can GMA be peacefully prosecuted without a decisive change in government? These are some of the things we must bear in mind this year, once we troop to the polls. Let us keep our eyes and ears pealed. The city of Calapan is plastered with the initials RGV - public works, vehicles, buildings. The letters are shaped a certain way, a distinctive font. These three letters are inescapable, they assault you everywhere. Rodolfo G. Valencia has been campaigning for a long time. He owns many businesses in Oriental Mindoro’s capital. It is his right of course to put his initials on any object purchased with his money. In Manila, faces of politicians of every stripe and hue are also plastered on every available surface. Visibly photoshopped, the aspiring barangay captain, councilor, senator and president is strategically placed on moving buses or inert buildings and light posts. On television, there are thirty-second audiovisual presentations with catchy blurbs made palatable by poppish music. In four months citizens will troop to polling precincts to choose their leaders from the barangay to the national level. Four short months. I have been waiting for real substantive messages from any one of these politicians. I have been waiting to be engaged in a debate on problems and possible solutions. And there are problems aplenty. All there seem to be are problems. As one who has closely followed the American elections last year, I have been thoroughly disappointed by the Philippine ‘pre-campaign’ period so far. Will there be a debate on healthcare? Economic reform? Public debt? Human rights? Agricultural policies? Environmental protection? I may yet expire from holding my breath. Next month will mark the beginning of the official marketing and mud-slinging. In four short months our aspiring leaders will make promises, all sorts. For once I would like to hear outlined HOW they will deliver on these promises. EXACTLY. I am sick and tired of the meaningless posturing. I have nothing but contempt for those who engage in politics for politics’ sake. Because then the road to the presidency, the seat in congress, the barangay captaincy becomes nothing more than a calculated pursuit of power. Power – the ability to coerce others to do what one wants - no more no less. Politics then degenerates into a mad scramble for scraps. Picture them rabid mongrels, hackles raised, ready to bite, claw and jockey for position for the tenderest of morsels. I sometimes wonder whether any of these politicos even bother to think of what is at stake, lost as they are in this game of one-upmanship. Would-be Mr. President, do pray tell, WHAT IS AT STAKE? Their sound is old, but they're a young band. Its a nice little high when one discovers great music. This two-man band is a rare find amidst all the crap out there. Love love love. Hopeless in French is désespoir, a hint more desperate than hopeless. The English word connotes some hope left behind, the French means hope taken, as one denudes a forest of trees. The former is a tad gentler than the latter. Hope-less does not mean hope-none. I suspect the English word despair comes from désespoir. Hopeless is a noun and an adjective. The French is désesperé, very close to the English desperate. They say that French is more abstract, the romantic lacking the precision and rationality of the germanic. In French, one says things in a roundabout manner, it takes a little longer to arrive at a point. It is true that when one translates something to or from either language, the English version is almost always shorter. But what can be more blunt than despair and desperate? Filipino does not have a direct equivalent of hopeless, so we append the negative ‘wala.’ Because the verb and the adjective is the same phrase – walang pag-asa – it feels as though the expression is more complete, a conclusion. Hopeless and désespoir are conditions, that is, conditional on something else. Walang pag-asa, in contrast, does not connote conditionality, at least not to the same degree as the other two. Not a condition but a decision. This assessment was written in 1996. Author Mark Thompson offers one key element that could make or break the Philippine democratisation project. Thirteen years later, it seems we failed to meet this element. And so, here we stand. "A key to stable democracy is the extent to which weak performance, particularly in the economy, leads to system blame. Recent democratic transitions in Portugal and Spain occurred under poor economic conditions, but the people of neither country attributed them to democracy. In the Philippines, the record of democratic commitment is mixed. Since the fall of Marcos, the high opinion ratings given democratic politicians despite declining living standards speaks for stability. Although at the midpoint of the Ramos presidency the Philippine economy is improving (with a growth rate of 5.1 percent in 1994, projected at 6.5 percent in 1995), it has a long way to go to match the "miracle" economies of most of its Southeast Asian neighbors. In the pre-martial-law Philippines, government corruption and economic problems contributed to growing elite criticism of democracy. Political leadership has made the decisive difference between then and now: Aquino's (and thus far Ramos's) commitment to democracy contrasts with Marcos's destruction of it. However, if the Philippines does not achieve sustained development, the temptation to exploit this failure could again endanger the country's democracy." An excellent scholarly article written by Ms. Carolina Ruiz-Australia of the UP College of Law back in 2004. After almost 500 years of Spanish colonial rule, Canon law and laws of Spanish origin continue to dominate Philippine family, civil and penal law. Most if not all of these laws place serious limitations on the realisation of women's sexual and reproductive rights. Since 2002, the current president, Gloria Macapagal Arroyo, has increasingly substituted church dogma for state policy, i.e. revoking the reproductive health and family planning policies of her predecessor, rejecting all modern contraceptive methods as forms of abortion, limiting government support for family planning to providing natural methods to married couples, and restricting access to emergency contraception. This article reflects on which advocacy methods will best serve the goals of sexual and reproductive rights when conservative church interests dominate state policy, as is currently the case in the Philippines. Religious fundamentalists, at one and the same time, argue for religious accommodation of their views by the state on the grounds of religious freedom but refuse to entertain, let alone accommodate, a plurality of views on women's sexuality. Thus, it is not enough to base a case in support of sexual and reproductive rights on the separation of church and state since, even though the State claims it is secular, it still manages to impose restrictions and control over women's bodies. The future has arrived. Now is 'when I grow up.' I wish somebody had said one should not wish to be something when one grows up. It implies an end point, a finish line. Well, here I am. And I am finding the race hasn't even really begun. A sound advice I would give my child one day, just be. Live, be present. The future will unfold as it will. I went over my old posts to compile a 'best of' list and laughed my head off at some of the things I've written. How I love being the drama queen. The star of my tragicomedies. Much of it is anxiety I think. Always anxious about the future. What did I learn in 2009? To let go. I have mixed feelings about this though. I am losing some of my urgency. This must happen now. I have to do this now. Urgency makes one feel every little thing is important. And now? Not everything is important. I am losing the immediate. I wonder what will replace it. Time is slower these days. The seconds ticking by without reason. I feel ambiguous, for the first time uncaring. The future has arrived and I am feeling blah.